I am very active, and I do cardio 6 times a week, changing it up between treadmill running, HIIT on the treadmill, and the Elliptical. I am doing the P90X Ab Ripper twice a week, and after my long runs I do few minutes of rowing, biceps, triceps and some fitness ball exercises. So I do a lot, or at least I think I do? My goal was never to lose any weight but only to tone my body, which all of the above is doing very well. But, I am getting bloated every day as soon as I have a bite to eat and it doesn't matter what I eat I become bloated. If I tense my ab muscles I can see some ab packs coming through but as soon as I relax my belly all I get is this huge bloat. I am not following any special diets and I think that might be the problem. I drink a lot of water, I have green tea in the morning, I drink one cup of coffee a day, and for breakfast I usually have some steel cut oats with fruit, or yoghurt with fruits (as pre work out meal). I have a protein drink as a post work out meal (MuscleMlk). My lunch mostly consists of a sandwich or leftovers from previous night’s dinner. Dinners always consist of meat and sides, be it rice, potatoes, veggies or salad. I eat a lot of fruits and veggies and stay away from alcohol (mostly). I am not dieting but I am watching what I eat. So why the bloat? What do I do about it?? How do I get rid of it? Please help! We all know you cannot spot reduce, and as much as spot reduction has turned into a multimillion dollar business, there is still no way of telling our bodies to lose fat from here or there. However, that does not mean that the body you desire is out of reach, you simply need to be willing to put in the work to get there. Those people who look fantastic, the ones we strive so hard to look like all the time, work harder than you can imagine to look that way. Yes, some of them are genetically born that way, which is totally unfair, but most work their butts off (literally). There are no cheat days, or cheat meals, or muffins with coffee, or bread or cake or wine or chocolate. There is no pressing snooze in the morning and skipping a workout. It takes focus and pure determination. I, myself, choose to have wine and chocolate and sometimes I do skip my workouts but I still work hard and the body I have represents my lifestyle. Is it perfect? No. But it is healthy and strong and I love the curves that I have. I have to say this first - if you are concerned this may be more than just diet and exercise related, go see your doctor and see if it is not a medical condition that is causing the bloat. You could also speak with a naturopath to see if you have any specific allergies to foods, which could be the culprit. With that being said, you want to get rid of your belly bloating? Then diet is number one. You need to eat clean, and by clean I mean nothing out of a package. You need to cut out sugar, alcohol and simple carbohydrates and stick to vegetables, fruit and lean proteins, with the odd serving of complex carbohydrates when you need them. If you can’t go the naturopath route (as they can be quite expensive) try an elimination diet and see if you notice a change with a particular food. Also, watch that you are not eating too much in the way of raw fruit and vegetables. The enzymes in raw vegetables can be hard to digest, so perhaps try steaming your veggies first. Your post workout meal is only necessary if you are not getting in enough calories in your day. These types of recovery meals should not be an added meal, but a meal you would normally have, just planned to be consumed before or after your workout. MuscleMlk is one of my favourites, but it is full of protein and calories that, if you do not need, can undo all the exercise you just did at the gym. Try following a meal tracking application like MyFitnessPal and see if you are over or under eating in your day. The next step is exercise. Pick up the intensity of your workouts. Interval training is a must, as that is what is going to put the tight and toned muscle on your body. The High Intensity Interval Training you’re doing is great. Spin classes work great once or twice a week to burn mega calories as does running. But I mean running, not jogging, which means you keeping your heart rate above 80% for the duration of your run. Also, take a look at how you are training your abdominals. I have recently started studying Pilates, as well as practicing it, and have a greater understanding as how to train your abs correctly. You need to stop working your rectus abdominus (your six pack muscle) and cue into the deep core muscles. If you are doing a sit up, or crunch, or plank, you should focus on drawing your abdominals deep to your spine. Imagine you have a string that is attached to your belly button, from your spine, and it is pulling your belly button deep during your movement. This prevents what I call the “loaf of bread” from popping up. What does this mean? When you are doing a sit-up, or any abdominal exercise for that matter, your superficial muscles (the ones that sit on top) should not pop up. If you are pushing these muscles out, you are going to continue to have that bloated stomach look. Find a Pilates class in your neighbourhood and learn these techniques. You will be astonished at the changes in your body if you commit to six weeks of proper core training. If you want it, you can get it, but you need to understand the work and sacrifices that are necessary to reach your goal. It is not impossible, but a slip up here and there can make it seem that way. 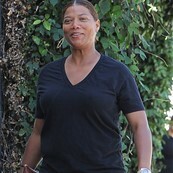 Attached - Queen Latifah heading to the gym yesterday.